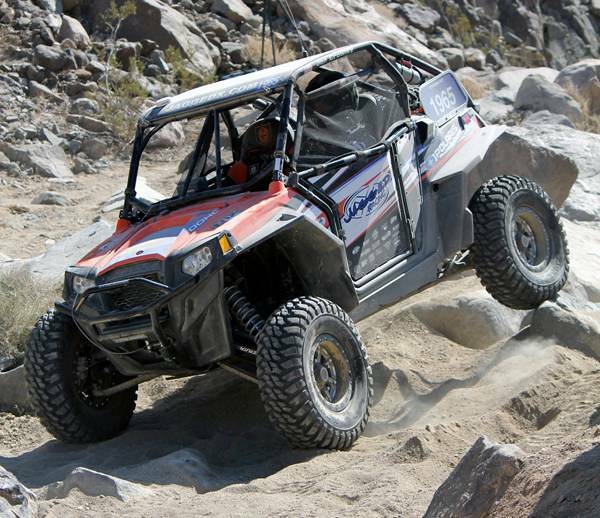 Johnson Valley, CA – Thirty-five UTVs would take the green flag at the 2013 HCR King of the Hammers UTV Race, but after 115 miles and almost 8 hours, only three would finish by the 5 PM time cutoff. In first place was now four-time KOH UTV race winner #1 Mitch Guthrie and his son Mitch Jr. in their Holz Racing Products Polaris RZR XP. Right on their heels with just a 16 seconds between on corrected time was #1965 Jon Crowley and Blake Van de Loo in their Jagged X supported Polaris RZR XP. #1924 Matt Enochs followed just a few minutes late in his Polaris RZR XP, making it a clean sweep of the podium for Polaris Industries. The King of the Hammers race is billed as the hardest off-road race on the planet and the course this year would lend credence to that statement. The UTVs followed the same course laid out for the Every Man Challenge class and started one hour behind the full-sized stock and modified stock classes that can run tires up to 37 inches tall. The course would run through 50 miles of some of the gnarliest whooped out desert before heading back to the main pit. After another 20 miles, the course would then start into the serious rock sections. EMC and UTVs would have to climb Aftershock, then Highway 19/20 before heading into remote pit 2. Most competitors would break by this point, but for those that kept it together, there was a lot more in store. From pit 2 they would climb Fissure Mountain, then down Jackhammer, up Chocolate Thunder, up Wrecking Ball, down Clawhammer, up Lower and Upper Big Johnson and back down Boulderdash before heading to remote pit 2A. From there it was Enochs in the front, then Guthrie and Crowley all within minutes of each other. They headed back into the desert for 6 miles before climbing up Elvis. The sun was getting low and the 5 PM deadline loomed and Guthrie met in Elvis. Guthrie cleared the last obstacle just seconds ahead and Enochs was somewhere out front. Somewhere around race mile 108, Enochs had a flat tire. This allowed Guthrie and Crowley to pass with just over five miles left. Guthrie crossed the finish line first with Crowley less than a minute behind. Race officials put both up on the stage until they could determine actual time on the course. After IRC tracking was verified, Guthrie captured first place by just 16 seconds.